A Pessimist Is Never Disappointed: "Love, luck, and money, they go to my head like wildfire"
"Love, luck, and money, they go to my head like wildfire"
What human being or instrument produced that drum sound on "Can't Be Sure" by The Sundays? 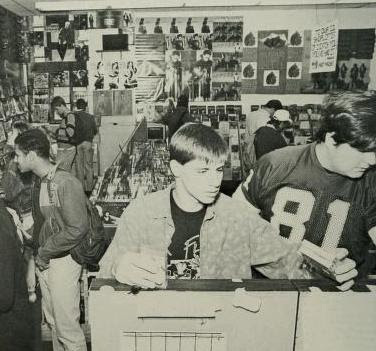 In 1989, I was working at a record store called The Record Co-Op, buried in the basement of the University of Maryland Adele H. Stamp Student Union building. I worked there from 1988 until 1990, when the store went out of business. I started shopping at this same store in 1987. The first time I saw the store was probably in late 1985 when a friend gave me a tour of the Student Union building way after all of the shops had closed for the day. I just stared in the window of the closed Record Co-Op and made a mental note to visit sometime in the future. I bought all of the Eno solo cassettes in this shop's "cutout" bin in late 1986, I'm guessing, and then, more significantly, I bought the import cassettes (I moved away from vinyl as a format as soon as I could) of Virginia Astley's Hope in a Darkened Heart and the first self-titled Throwing Muses albums in the summer of 1987. Little did I know in just over a year later, I'd be working at the store as "night manager" and import buyer. These are some of the only photos I've been able to find of the shop. This is my friend and boss at the Co-Op (he was Assistant Manger and I was "night manager" [whatever the hell that was supposed to be!] and import buyer), Don. Don runs the Ferris Saves website devoted to that film and many others; Don is a walking encyclopedia of 1980's teen movie tropes! This is also from the 1988 edition of the yearbook. An era when George Michael's Faith album was still selling strong a full year or more after its release! Now, while I did try to get good stuff on CD into the Co-Op's stock, it was a losing battle with our limited suppliers; The stuff I wanted I had to get in D.C., naturally. I'm pretty sure that I had been to Yesterday and Today -- or Y&T -- in Rockville at least once but, as that store was mainly good vinyl, I didn't go back that often. And in 1989, I had yet to discover Vinyl Ink. The late, great George Gelestino's store was exactly the sort of shop I wanted the Co-Op to be in my head; I envisioned a hipster paradise -- no more selling Escape Club cassettes to hairclipped sorority girls! 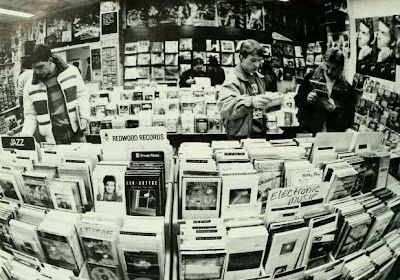 So even though I worked at a record store that I was first a fan of -- a store I still think was pretty damn good when all's said and done -- to get my fix, I had to drive into Washington, D.C. and hit Tower Records or Olsson's in Georgetown. 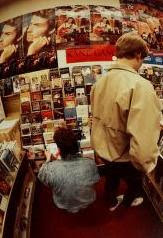 While I bought A LOT of import cassettes and import CD's at Tower in D.C., I bought the best stuff at Olsson's in Georgetown: all of my Creation and 4AD CD's I bought there in 1988 when I got my first player; I got XTC's Black Sea there as well when it was not on CD in America and still only on import. I usually hit The Key Theatre in those days and then Olsson's afterwards. 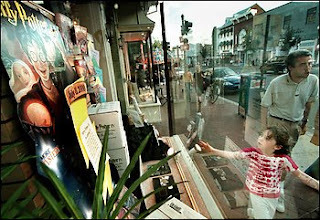 This photo dates from when the shop was probably about to close -- the area where the Key used to be is across the street. Even up until the mid-1990's Britpop era, I was hitting this same store; I briefly worked a nightshift job in Chevy Chase, up Wisconsin Avenue, in 1996 and I'd take a "lunch" at 9:00 PM and fly down a weekday-night-deserted Wisconsin Avenue, get a great parking spot, and run in and flip through the CD bins in search of import CD singles from The Auteurs, Sleeper, or Gene. 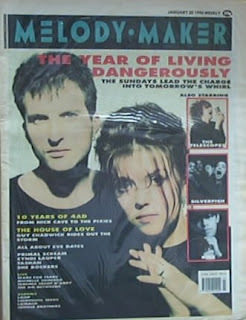 So, back to 1989: I had been reading a lot of glowing reviews in Melody Maker and NME about The Stone Roses and The Sundays. An RCA label guy in NYC had me on the phone for something one spring day at the Co-Op and I asked him about RCA/Silvertone signing the Roses. He RAVED about the LP and promptly went home and taped the vinyl album for me. By the time that album came out, my coworkers and I were already pretty big fans of the Roses thanks to that homemade cassette. 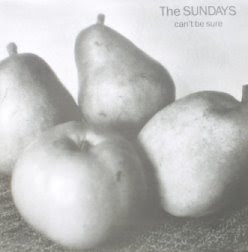 As for The Sundays, my options were limited until, finally, one weekend, I found the import CD single of "Can't Be Sure" in Olsson's in Georgetown! It was a mini-CD that you had to buy an adapter to play in a normal CD player. I'm pretty sure I bought an adapter at Olsson's so I could play the CD when I got home even though my work -- the Co-Op -- had adapters lying around behind the counter. Since I didn't have a car CD player at that time -- who did? -- that was a long ride home but when I finally put the headphones on, I was thrilled. The first thing I heard -- before Harriet Wheeler's perfect English voice; before David Gavurin's knife-on-waterglass guitar -- was the drums. To this day I still can't tell if they are the world's greatest drum machine, second only to the Cocteau Twins' drum machine, or if they are indeed physical drums being played by a human being. I do remember that I quickly made a mixtape featuring the three songs on this import single called "I Felt The Rain and Called It Genius" (a line from Aztec Camera's "The Boy Wonders") and took it into work the next day; beyond the Aztec Camera, I can't remember what else I put on that tape -- probably some Go-Betweens, I'm guessing. I think I played "Can't Be Sure" quite a few times in the store, each time getting the usual "What's playing?" question from a college kid customer within a good 30 seconds of the song's start. After me telling the kid what it was, I'd have to break the news that it wasn't something on sale in the shop. A few more incidents like this and the store's boss, Andy, took me aside and gently asked that I not play stuff in the store anymore that we couldn't at least order. I could still be the cool guy with the great taste provided it was something I had on sale or something I could get shipped in from our supplier! Hey, it could have been worse; Andy could have been like the district manager of the chain store record shop I worked at a year later who browbeat me for playing Marvin Gaye's Greatest Hits in the store because it wasn't a Top 40 release. By the beginning of our shop's final year (1990), word was out that Warner Brothers/Sire had signed the band in the States. Plain blue covered advance cassettes showed up in the store that spring before we closed, just in time to play in the store and thus create another generation of fans and hipsters. "It's good to have something to live for you'll find/live for tomorrow/live for a job and the perfect behind."